A year since the death of two men in the police firing in Tawang, a complete disclosure of events remains elusive. On May 2, 2016, protestors seeking the release of Lobsang Gyatso, a Buddhist monk and vocal opponent of large dams in Arunachal Pradesh’s Tawang district, had gathered outside the police station where he was being held on charges of allegedly defaming the abbot of the 336-year old Tawang Monastery. 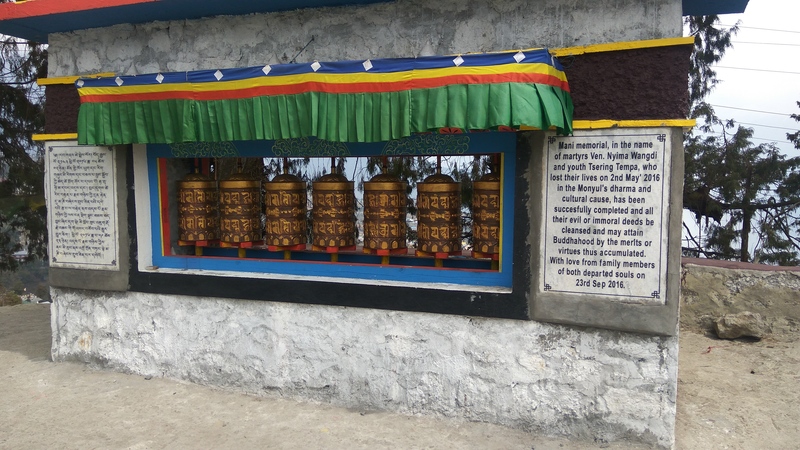 A memorial that was built at the gates of the Tawang Monastery to remember the two killed in the police firing. After learning that Gyatso’s bail appeal was turned down, the crowd got engaged in a scuffle broke with police and security personnel. During the scuffle, security forces fired shots which injured several people and claimed the lives of Nyima Wangdi (a young monk) and Tsering Tempa. The events of that day had left everyone shocked. Tawang, after all, is known more as a peaceful town and such a thing was rather unexpected. Following the deaths, the government did its best to pacify the situation by awarding ex-gratia payments to the family of the deceased and giving jobs to next of kin. It also paid for the medical expenses of the injured (although some feel that the amount paid does not cover all costs). One person, Tenzin Wangdi, who miraculously survived after a bullet was lodged in his head is reportedly suffering from trauma and has trouble sleeping. Recently, the Supreme Court sought responses from the Centre and the state government on a plea seeking an independent probe. While the state government had set up two inquiries to investigate the matter, only the report by the Jang ADC has been submitted while the state-level report that was to be prepared by current PWD commissioner, Hage Khoda, has not been submitted. After the incident, the government suspended Tawang district superintendent of police, Anto Alphonse (who has since been reinstated), and officer-in-charge of the Tawang police station, Lham Dhondup. Currently, seven security personnel are serving suspension including three Indian Reserve Battalion men and four from the Arunachal Pradesh Police. Sources also say that the West Kameng deputy superintendent of police is conducting the investigation. The ADC’s report has several varying accounts of the day as recorded by eyewitnesses and police. The report cites the police report which states that “after proper warnings, use of force was done by restrained firing. The firing was resorted to, as police force was very limited at the police station. Since the police station location is at hilly terrain, the injuries were at different parts of the body of the injured persons”. However, eyewitnesses cited in the ADC’s report maintain that it was after the police resorted to lathi-charge and firing that stones were pelted. The report also states that “the firing order was given verbally by the magistrate RD Thungon, EAC. It is further stated in the police report that the duty magistrate, RD Thungon, refused to give the firing order in writing after the incident”. However, Thungon said that “he did not know who opened the fire and also did not know who had ordered to open fire”. There are also some findings that shed more doubt than light on the events of the day. “The SP, Tawang’s report further states that the statement of the Platoon Commander SI Tage Tath of 3rd IRBN was contradictory in many ways as he stated in his statement before the SP, Tawang that as per the instructions of the SP he ordered that all their weapons be kept under lock in the district KOTE itself. This was done to avoid reckless handling of weapons by the IRBN personnel during the law and order problem. After the firing incident, despite of clear order from the SP, Tawang the Platoon Commander, 3rd IRBN failed to furnish individual count of missing or fired ammunitions from each of the police personnel deployed under him on that day,” the report states. The report also carries allegations of alarming behaviour by security personnel. EAC Lobsang Tsetan states that he had tried to stop one constable from firing at a civilian when “an IRBN sub-inspector, who was the platoon commander, intervened and asked the jawan to shoot at the deponent i.e. the magistrate instead”. The ADC’s report in its findings states that “the weapons were collected by 3rd IRBn personnel and civil police personnel in presence of the SP, Tawang”. It also states that “police personnel resorted to blank firing in a very reckless manner and without proper supervision and directions from any senior police officials” and that the firing was “completely reckless and indiscriminate”. The report also, however, partly holds the protestors responsible as well, stating “if the crowd had respected the rule of law, the unfortunate incident could have been avoided”. It also recommended that a thorough investigation should be made into the matter by an independent agency.